Linfield opened a massive nine-point gap at the top of the Irish Premiership by beating second-placed Ballymena United 1-0 at Windsor Park. Defender Josh Robinson headed the goal from a corner in the 54th minute. 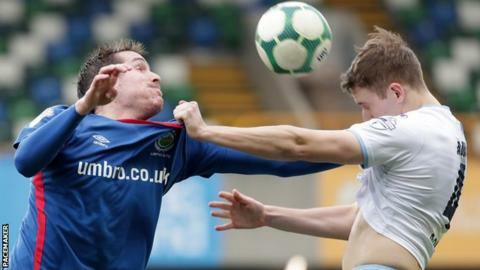 Ballymena have a game in hand but Linfield are in the driving seat with nine matches to go. Elsewhere, Warren Feeney's Ards are off the bottom after beating Newry while Cliftonville saw off Warrenpoint and Coleraine and Institute also won. Linfield were facing nearest challengers Ballymena for the second week in succession and secured their fourth win in five games in all competitions over the Braidmen this season. David Jeffrey's side dominated possession in the first half but were unable to create many clear-cut chances and find a way through the resolute home defence. Linfield looked more positive after the break and Robinson rose highest to head home from close range from Kyle McClean's corner just minutes after seeing his 25-yard right-foot piledriver crash off the post. Ballymena came close to equalising late on when substitute Shane McGinty's header from a Leroy Millar came back off the bar and then referee Tim Marshall waved away penalty appeals after Jimmy Callacher appeared to handle Adam Lecky's well-struck shot. Linfield have now won nine straight league games as their bid for a 53rd Irish League title continues to gather pace. In a remarkable second half at the Coleraine Showgrounds, the hosts missed two penalties before eventually seeing off Glentoran 2-0. Glens defender Calum Birney was sent off for handling the ball on the goal-line but Jamie McGonigle (51 minutes) and Dean Shiels (60) both fired over the bar from 12 yards before substitute Eoin Bradley (66) successfully converted Coleraine's third penalty inside a 15-minute period. Ben Doherty scored Coleraine's second goal from close range on 86 minutes after goalkeeper Dwayne Nelson had kept out a James McLaughlin effort. Paddy McLaughlin's record as Cliftonville manager now stands at two wins from two after a comfortable 2-0 victory over Warrenpoint Town at Milltown. Ryan Curran, in devastating form, scored both goals. His first came after he drove inside and caught Point keeper Berraat Turker out at his near post. The number nine's second was another accomplished finish, rifling a right-footed drive into the far corner after having been slipped in behind Town's back-line by Aaron Harkin. The hosts' best chance of the game arrived early on when Richard Brush saved Alan O'Sullivan's shot, shortly before Reds left-back Conor McMenamin was denied his second goal in as many games, seeing his header cleared off the line by Daniel Wallace. Three headers - two from Mark Kelly and one from Damien McNulty - move Ards off the bottom and above Newry on goal difference as new manager Warren Feeney made a winning start. Kelly opened the scoring in the 26th minute, guiding home a well-placed header from a right-wing Eamon McAllister cross. It was 2-0 four minutes later when defender McNulty powered home an unstoppable bullet header from a corner, before Gerald Pender pulled one back for the visitors 10 minutes into the second half. Any nerves the home players might have had were eased in the 65th minute when Kelly was free at the back post to head home from close range from a McAllister cross. Institute made it back-to-back wins under interim manager Kevin Doherty by seeing off Dungannon Swifts at the Brandywell. Jamie Dunne and Joe McCready scored as 'Stute moved above their opponents and into seventh place in the Premiership table.